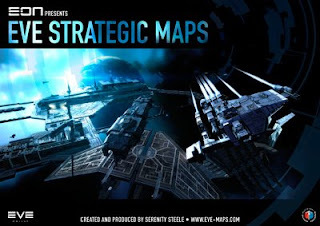 CrazyKinux's Musing: EVE Strategic Maps will ship late, and that makes me happy! Wow! That's really exciting news. Can't wait to find out what this "completely new content" is going to turn out to be. Presumably more than just some new systems and regions. Thanks for keeping us up-do-date as always, CK. And will the SS maps be available as a PDF so I can download them, search them, display on my secondary and tertiary monitors, print them on A3, scribble all over them, laminate them, crumple them, print them out again, cycle them as fire-lighters? OK, that doesn't help with the search - but maybe they'll provide a helpful index! I'll be waiting for the leather bound edition! The unholy combination of Serenity Steele getting into bed with EON's MMM publisher, being given privileged access to content by CCP, and running for election to the CSM makes me feel quite queasy. "Trinity, Transparency, Trust, Serenity" - I don't think so. Ah well. Another 15 Euros saved for my retirement.